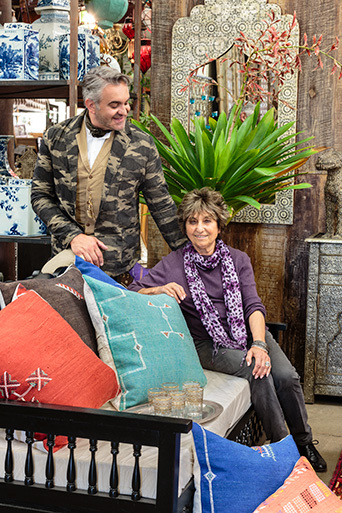 World traveler; buyer extraordinaire; highly educated; are all words that Suad Cano—owner of Berbere World Imports showroom in Los Angeles—embodies. The path of Berbere World Imports’ inception twenty-eight years ago to its current success is the direct result of Cano’s deep passion for art adventures and travel, which have taken her to some twenty-two countries in Asia, the Middle East, Africa, Europe and beyond. 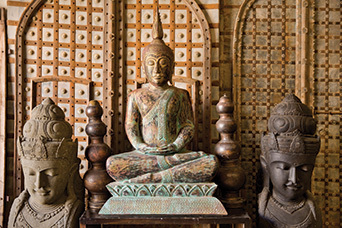 These days she embarks on two to three buying trips a year, keeping her to-the-trade clientele of interior designers (think Martyn Lawrence Bullard, Kathryn M. Ireland and Cliff Fong), landscape designers, set decorators and event planners in mind. “I am very close to many of them,” she says, “and have learned their styles, what they like, what they want, their direction. That’s really my interest,” she continues, “but I sometimes also find things for me,” she laughs. “My house in Venice [California] is continually changing!” Her discerning eye and keen sense generates containers full of hand-picked, hand-crafted, one-of-a-kind eclectic furnishings, accessories, lighting, pottery and textiles that are shipped from foreign countries to California. Born in Bagdad, Iraq, Cano came to the United States when she was very young. “I feel very native to California,” she says. “I received my degrees—college and master’s—in this country.” A master’s degree in psychology and social work landed her a career working with young children—mostly in the depressed areas of East Los Angeles and South Central. 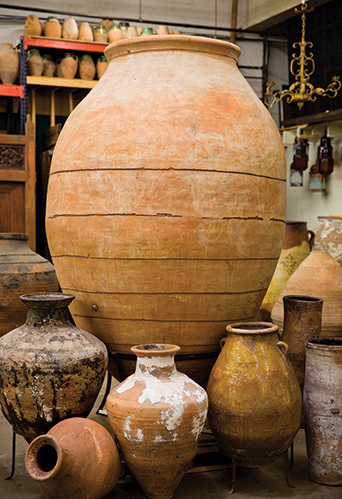 Little by little both Cano and her husband segued from their careers—he in the justice department—to selling the treasures found on travels. On one of Cano’s trips to Morocco she sought out Berber weaving—native to North Africa—and befriended a local artisan who owned a company called Berbere Imports. “I said to him, ‘I am going to carry the same name as your company’ and he said ‘that would be fantastic!’” Therein the name of her business had been chosen. Over the following two decades, Cano’s Berbere World Imports went from it’s small storefront to a three-hundred-square-foot space on Beverly Boulevard to a three-thousand-square-foot space on Robertson Boulevard to the fifty-thousand-square-foot warehouse they now occupy in Culver City. In fact, they continue to evolve and are slated to move to a new space in Inglewood this August. “No matter what, when you travel to a foreign country you always have to have a great deal of respect for the people you are meeting with,” she shares. “Their culture, their habits, their religion.” Beyond her innate passion for travel and talent for sourcing, this collector is also as humble as she is wise. “I love my business. I look forward to coming to work every day and I don’t see myself ever retiring from the business because, really, I see it more as a hobby.” An incredibly successful one at that. 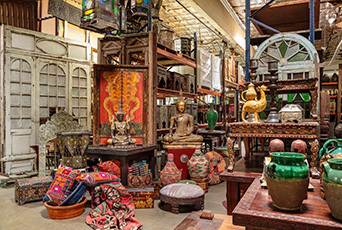 Berbere World Imports, 3049 S. La Cienega Blvd., Culver City, California, is currently holding moving sales, which are open to the trade and to the public through August. www.berbereworldimports.com.